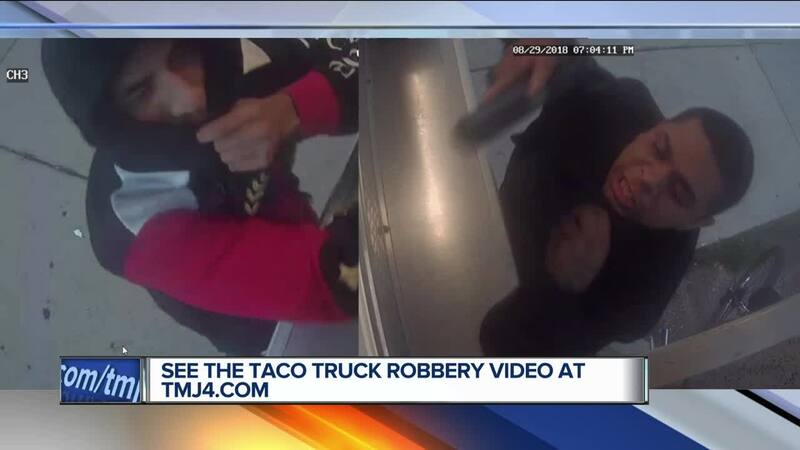 The Milwaukee Police Department is asking for the community's help to identify the suspects involved in several taco truck robberies on Wednesday. Five separate taco truck robberies took place between 7 p.m. and 8:45 p.m.on the city's south side. Police turned to Twitter for assistance in finding the three suspects responsible. The Milwaukee Police Department is seeking the community’s assistance in identifying the suspects involved in several taco truck robberies which occurred on August 29th between the hours of 7:00 pm and 8:45 pm. The first suspect is a Hispanic male, 20-25-years-old with short dark hair and a tattoo on his right hand. Police describe the second suspect as a Hispanic male, 20-25-years-old and the last suspect a black male in his 30's with shoulder-length braids. Police say the suspects approached the taco trucks, pointed firearms at the people inside and demanded money. They were seen fleeing the scene in a newer model red or burgundy Nissan Sentra without a front license plate. Anyone with information can contact Milwaukee Police at 414-935-7360.